Answer a simple question and you could win a 3lb Christmas Tin of original recipe Jane Parker Fruitcake. No purchase necessary. Winner chosen at random. Enter now. Winner was chosen at random, there were no right or wrong answers. Stay tuned for another fun Giveaway, coming soon. Here’s how the Giveaway progressed. Jane Parker Original Recipe Fruitcake made a triumphant return in 2017, and this year, they’ve added a couple of new additions to their line. More on those in a moment. These cakes are fresh from the bakery and ready to order just in time for the holidays. The fine folks at Jane Parker have provided us with a 2018 Christmas tin, filled with 3lbs of delicious Jane Parker “Dark” Fruitcake to giveaway. And, I got one to test an review. Smile. No right or wrong answers. Winner will be chosen at random. Q – What memories do you have of the original A&P Jane Parker Fruitcakes? 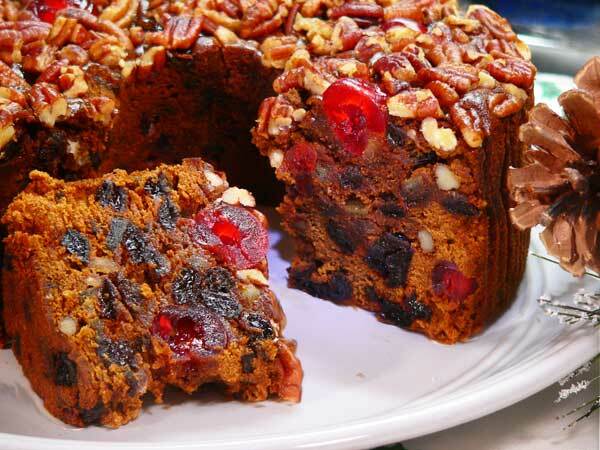 Q – Did you know Jane Parker Fruitcakes were available again using the original recipe? Q – Would you like to WIN this 3lb Jane Parker Dark Fruitcake? Take your pick. Answer either one and if you like, share your memories of the Jane Parker Fruitcakes from years back. I’d love to hear your stories. We’ve made it easy. If you don’t remember the original Jane Parker Fruitcakes, just tell us you’d like to win one so you could try it. No answer is right or wrong. Winner will be chosen at random. Only one entry per person and you must be over 18 to enter. Open to the lower 48 states only, with apologies to all our other visitors. Winner will be selected at random, via Random.org. There is no right or wrong answer. Contest ends at midnight Eastern time, Saturday – November 10, 2018. Winner will be posted on Monday, November 12, 2018. Check back at the end of the giveaway to see if you’ve won and to claim your prize. Winner will be asked to submit your full name and address to us should you win. PS: Your Comment will not appear immediately, but be assured you’ll be entered if you leave a comment before the deadline. I’ll approve and post the replies just as quickly as possible. Thanks. Good Luck, and thanks for entering. Doesn’t this look good? Well, rest assured that it IS GOOD. Really Good. Smile. These cakes are fresh from the bakery and ready for immediate shipping. That means they’re super moist and they will stay moist right through all the holidays. Do you know someone that would remember them and like to enjoy that taste again? Did I mention they are made using the original A&P Grocery stores recipe? They are! This year, Jane Parker is happy to introduce this new THREE POUND Christmas holiday tin of their Dark Fruitcake. And, I did mention they had two new additions this year. They also now have a 3lb Jane Parker Fruitcake, baked to the original recipe with the addition of Bourbon and Rum. It’s not soaked into the cake, but baked into the cake. These cakes are filled with more than 2/3rds of delicious fruits and nuts. Big and plump juicy raisins, glace red cherries, glace golden pineapple, orange peel an LOTS of crunchy pecans are just some of the very fine ingredients used to faithfully reproduce the original recipe. I loved how moist this cake was. Not dry and “more cake than anything else” like a lot of other fruitcakes I’ve had before. The Dark version features the addition of brown sugar with a bit of molasses which just takes you back in time with the very first bite. So good. I might have had a second slice. Smile. Did I mention they are MADE IN THE USA? How cool is that? 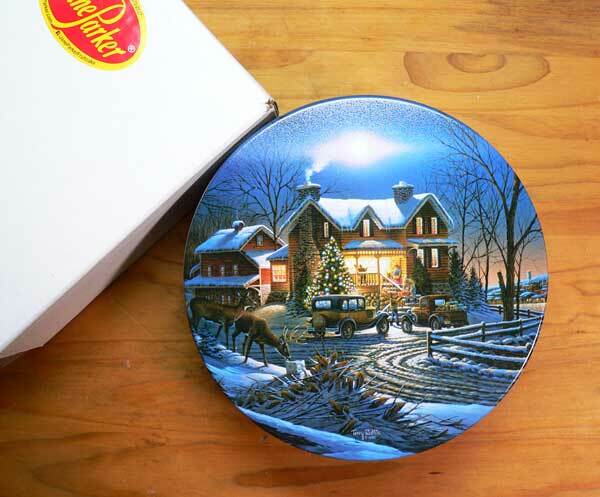 The really nice decorative tin makes it a perfect gift for Christmas, or maybe as a hostess gift. Each 48 ounce ring cake serves 15 to 24 people. Plenty for your family gatherings. And, it’s shipped in a nice strong corrugated box to insure safe delivery. You can ship it direct, or have it sent to you and then wrap it for gift giving time. How cool is that? Jane Parker Fruitcakes are available in either the Classic Version or the Dark Version in 16oz loaf sizes if you’d like something a bit smaller. Cakes are available in a variety of sizes from 16oz, 32oz, 48oz, and 72oz. The 48oz cakes are available in boxes or in the holiday tins. And don’t forget the NEW additions of the 48oz Dark and the 48oz Bourbon an Rum flavors in the holiday tins. Last year, I tested and reviewed the two cakes pictured above, the Classic and the Dark. You can see that review, and read more about the return of the Jane Parker Fruitcake when you visit that post here on Taste of Southern: Return of the Jane Parker Fruitcakes. You’ll learn how my brother use to manage our local A&P Grocery store and his memories of stocking the shelves during the holidays with lots of these fruitcakes. And, you’ll even learn how we were among the first folks to connect with Chris and his brother Alex from up in New York once they started working on bringing these iconic fruitcakes back. I hope you’ll enjoy the stories. PLUS, plans are already in progress to bring back the original recipe Spanish Bar Cake as well. So, share your memories and comments with us in the Comment section below and you’ll be entered to win. I wish you success. Check out my attempt to recreate the Spanish Bar Cake. Disclosure: All comments are my own. JaneParker.com provided me with one cake to test and review, and another cake to use in this giveaway. My 96 year old Mother-Law might even like me if I won and gave her this fruitcake. She loves fruitcake at Christmas, just kidding, she is a wonderful southern lady and we all love her stories from the past. display in the front of the store with the fruitcakes stacked around it. Every year my aunt would buy a Jane Parker fruitcake. I think this is why I love fruitcake. I would love to win the 3lb Jane Parker Dark Fruitcake. I love fruitcake and I have never had this brand. My grandmother use to make fruitcakes every year when she was alive. She has since past. I have not tried this brand of fruitcake yet. It looks yummy. Thanks. I would love to win this fruitcake!! Back in the day, before my time, my parents use to go to A & P and get their fruitcakes. They loved them!! I would love to win this fruit cake. I haven’t eaten a fruit cake since 1952. Just this picture makes my mouth water. I remember shopping at the A & P and during the holidays we didn’t have a lot, so it was a wonderful treat to buy one of these fruitcakes! That’s how I learned to love fruitcake! My Dad loved these fruitcakes (and so do I!) and he always brought one home at Christmas time. Back in the 50’s, my Grandfather would go 44 miles to the nearest A&P around the holidays and purchase several for gifts but a bunch for himself and Grandma. Seems they enjoyed it year round. Look forward to my order and maybe you will give me an extra one. Take care Steve, don’t topple off the pier!! I would love to win this fruit cake for my momma. I would love to win this fruitcake. I remember shopping in A&P with my Mom as a kid and then buying Jane Parker products after I got married. Love the fruitcake and also the Spanish Bar cake. I remember A&P as a kid but never had the fruitcake. Would love to try it you make it sound so good. I love fruitcake and have made it one year at Christmas. I have never had this type of fruitcake, but I would enjoy an opportunity to win the fruitcake. Just to know what all the fuss is about. Please accept my comment as a chance win and enjoy a delicious fruitcake without all the work. Thank you for the consideration!!!! yes.I would like to win this fruit cake. Yes! I would love to win this fruit cake! The Jane Parker fruitcakes bring back so many fond memories. The A&P stores always put up a festive looking display of them and they were my dad’s favorite treat for Christmas. He however, could not wait until then to eat one, so I always purchased one for him on his birthday in early December along with a new pair of slippers each year. Such simple yet precious memories of the past. My father owned the store fixture business that built the display fixtures for A&P stores in the Southeast. They were always painted two shades of green which my family still refers to as A&P green! 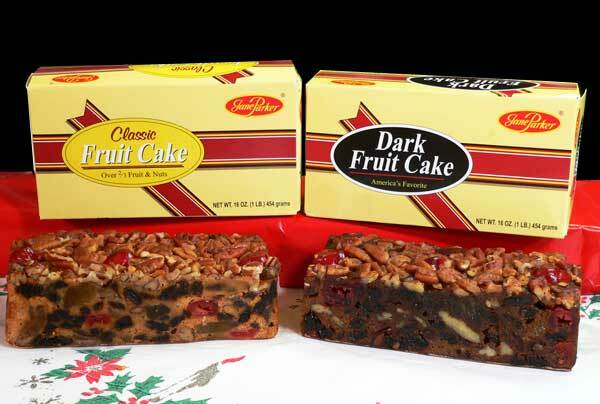 Jane Parker fruitcakes usually came home with my dad as soon as they appeared in one of the stores for the holidays. Our family preferred the darker ones and I have many memories of my parent’s friends dropping in during Christmas for coffee and fruitcake. Mother always had an extra one which she kept in the refrigerator,for months,for snacking! The smell of hot coffee, A cake plate with sliced Jane Parker fruitcake garnished with a sprig of Holly on a red tablecloth, good friends, conversation, love and laughter are precious memories for me. I would love to win this fruitcake. It has special memories of my Granny that she would share it with us when we were children. The spanish bar was also wonderful and we often enjoyed it too. Thank you for all that you do for us Steve. Hoping you will continue to improve and receive all God’s blessings. Wonderful memories of small town life in the 50s with family and friends. 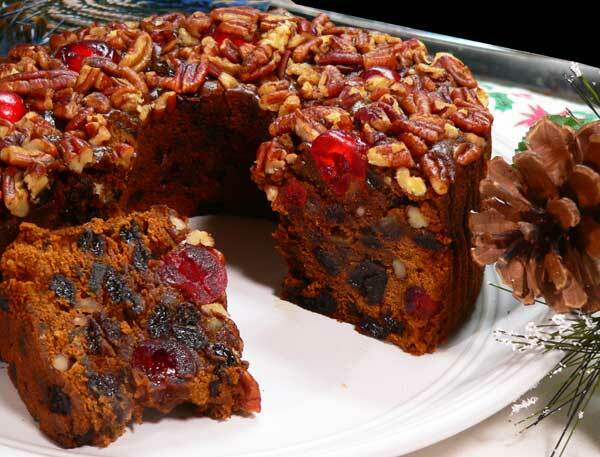 Jane Parker fruitcakes graced pretty much everyone’s dining room table or buffet table throughout the holidays. Whether a neighborly drop by, or planned visit, you were undoubtedly given a slice of Jane’s fruitcake, a hot drink and a warm chair. You chatted away about the wonders of the season, while admiring Christmas decorations, the Crèche, lights, old fashioned starched Christmas doilies,family photos, wet woolen mittens drying on a radiator, and always, always the poignant scent of the central focus—the family Christmas tree. I can still see the faces, the smiles, oh the memories! I bought one last year, its just the same. I cried as these precious memories surfaced. The cake was just as delicious as ever! They look wonderful. I would love to try one. I LOVE, LOVE, LOVE GOOD FRUITCAKE! 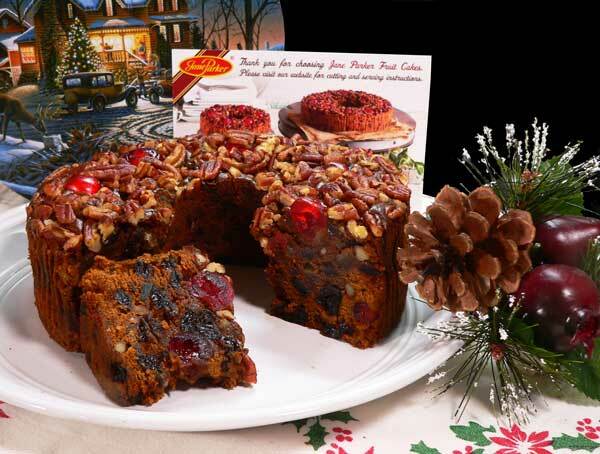 I HAVE NOT TRIED THE JANE PARKER FRUITCAKE, BUT I WOULD LOVE TO WIN ONE! REGARDLESS, I WILL PURCHASE ONE OF THESE CAKES SO I CAN TASTE OF IT! THE PICTURES SURELY DO LOOK YUMMY! I would like to win this Jane Parker fruitcake to share with my family at Christmas. My mom always made a fruitcake at Christmas, but I never have. Seems pretty intimidating! Thanks! I would love to win a cake to share during holidays. Looks delicious!!! My relatives are visiting during the holidays & I’d love to share this fruitcake with them. Now I live in Ruffin NC but grew up on Long Island NY. My Mother had moved up to NY from NC and met my Father and married and the rest is history but now I’ve come back to the place where I feel I’ve always belonged! Anyways I grew up eating every Jane Parker product from our local A&P grocery store and loved them all! YUM! I haven’t had the Spanish Bar cake for over 50 years and can’t wait! If I don’t win this fruit cake here you can bet I’ll be shipping one! Thanks Steve for all you do here and am glad you’re feeling better. Yes! I would love to win this 3lb dark fruit cake to eat during the holidays!!! I remember as a child we had this fruitcake and I remember I did not like the taste due to the raisins but I loved the tin it came in. I later fell in love with the taste of fruitcake when I began drinking coffee after the birth of my son. But the cake I remember later was the Claxton Fruit Cake. However, I have come to love raisins now. I would enjoy the cake and the tin. We always had Jane Parker fruitcake at Christmas when I was younger. I remember how moist and flavorful they were. My husband would love one. My grandma always had Jane Parker fruitcake from A&P for Christmas. Even though she and I were the only ones that liked it, she bought it for us every year. Thus far, I have not experienced the culinary pleasure of a Jane Parker fruitcake. Having heard them highly recommended, I would LUV to win one, so I can see what others are bragging about, lol! Oh wow, gracious. I didn’t know these JP fruit cakes were still being made. I have searched for years for them. Only fruitcake my family ate and loved for decades. I mean many decades?. Thanks so much. My elderly parents will be thrilled. My grandma start d the family on these and purchased at A and P south Florida. Then they left. We ate since I was. Born in 57! We switched to another brand that was just ok..but all we could find. After I searched on eBay and Amazon some years ago..gave up..even tried to get from A and P in NY..no go. So, for the last few years no fruitcake for us. So happy the original is back. Mom would serve with a side of citrus ambrosia..so so good..and great memories. Please make my day! Lol. I would love to try a Jane Parker Fruit Cake. My grandmother use to make them. It has been a long time since I have had one. Unfortunately I never had the privilege of tasting one. The A&P closed soon after I was born here but I do remember hearing the stories from my mother of how she wished she could get one again (No delivey or internet back then). I would love and cherish the chance to taste once what she described so often. Thanks for the opportunity to win one! I have not seen an A&P since the “70’s” but I know my father shopped there because it was on his way home from work. I am exited to hear about these cakes & would love to try one. I have not tasted a Jane Parker fruit cake before, but I would love to! This Is the only fruitcake I remember my family giving as a gift to other family members. Everyone loved it and everyone had to have one for Christmas. I would love to taste on again. I’m not familiar with Jane Parker Fruitcakes and have never eaten a fruitcake as dark of a color and would love to try it…with all of the fruits/nuts in this cake, it has to be delicious!! I would love to win a fruitcake. I am the only one in my family that likes fruitcake so, if i win, it’s all for me (kind of selfish, I know). Good luck to everyone! I would love to win this fruitcake. My husband grew up in Georgia and misses the fruitcakes his grandmother used to bake. Baking a fruitcake is one of the few things I don’t have the courage to try. Growing up, it wasn’t Christmas unless there was a Jane Parker fruitcake in the house. I tried baking one from scratch one year, and I know that’s how fruitcakes got a bad name. It was horrible, so the birds and squirrels had a nice snack. Luckily, a quick trip to the A&P ensured we didn’t go fruitcake-less that year. But, in more recent years as A&Ps disappeared, we couldn’t get our favorite holiday confection anymore. I knew better than to try to make one. So happy the real Jane Parker fruitcakes are back! It feels like the Christmas I grew up with again! My mother & grandmother both bought Jane Parker Fruitcakes for years. I’ve tried other brands but didn’t like them. My husband & I love Jane Parker Fruitcake. I’ve never really had a good fruitcake and would love to try this. It looks delicious! I would love to WIN this 3lb Jane Parker Dark Fruitcake! I know there are so many that don’t like fruitcake, but I’m not one of them! I’ve never been brave enough to attempt making fruitcake on my own, so I’d like to win! Thank you for the opportunity! i would love to win the fruitcake! Yes, I would love to win this 3 lb. Jane Parker Fruitcake! I’ve never has this treat, but I am sure to enjoy it with others if I win! We didn’t have an A&P but I remember my grandma bringing us a fruitcake each Christmas when I was young. I loved all the yummy fruit and moist cake. It has probably been over 40 years since I had one and would love to win one. Thanks for always looking out for us Steve! I am so glad you are feeling better and got your feet on God’s good earth and saw your “fishing hole”! My husband worked at an A & P as a young boy. He speaks of his love of the Spanish Bar Cakes! He doesn’t remember the fruit cakes. We would love to win one! I’ve never had one of these fruitcakes but they surely look delicious! Fruitcakes always remind me of being at my Granny’s house for Christmas. Such wonderful memories. I was the only cousin that liked fruitcakes and I still love them. Would like to win for my mother. She loves fruitcake. Thank you Steve for the time you take sharing with us recipes and memories. I have really enjoyed since I signed up for taste of southern. I would love to win this fruitcake. We did not have an A&P, so, yes, I would like to win to try the Jane Parker fruitcake. After reading about these cakes in your newsletter last year, I ordered one of each! They were delicious and the company employees were very nice. I would enjoy winning the 3 pound Jane Parker cake but I plan to purchase one of each again this year anyway. The holidays need fruitcake and Elvis singing Blue Christmas! So glad you are feeling well enough to get out a little. Please don’t over do it! Yes, I would like to win a Jane Parker fruitcake so I can try it. I love fruitcake and this one sounds so good! The A&P dark fruitcake reminds me of the fruitcake my Mom used to make each Christmas. I loved it. Yes, I would like to win this Jane Parker Dark Fruit Cake. It looks delicious! Thank you for giving us a chance to win it. I’d never heard of Jane Parker Fruitcake, but I remember we shopped at the A&P when I was very little before it left Richmond, VA – and my grandmother always had to get at least one fruitcake at Christmas. I’m guessing it was a Jane Parker while it was available here. Of course, since I didn’t know what it was then, I had no idea it was available again now. And, with using the original recipe no less. I didn’t like it when I was little, although the cake looked delicious – like I should love it. As I’ve grown older, my taste has changed a lot and I’m wondering if I would like a “real” fruitcake. I’d love the chance to win one & give it a try! Oh I have such happy memories of Jane Parker fruitcakes,was always so excited when they appeared in the store, they were simply the best ! Brings back wonderful memories. Always looked forward to the holiday season and having one of these fruit cakes in the grocery bag. My memories of my grandmother shopping at the A&P in Rocky Mount NC and taking me with her. She bought one of the fruit cakes every year and we really enjoyed eating them every year. The fruitcake looks wonderful. L would love to win this, and share with all west coast friends who don’t remember A & P.
Honestly, I have never liked fruitcakes but maybe this dark cake would taste different. I have never had this fruitcake, but I would love to try it. I love fruitcake and have been looking for a fruitcake like the one my mother-in-law used to make. It was a true southern fruitcake with lots of pecans. This one not only looks delicious, but beautiful. I would love to be considered for this fruitcake. Thank you! My father was an A&P store manager, so Jane Parker fruitcakes were always at our house during the holidays. My husband remembers and loves these fruitcake, I’d love to win this for him. I just want to add that I love your site and look forward to it every week. Thank You. I really love fruitcakes! Yes, I would really enjoy winning this fruitcake. It looks so scrumptious in the photo! I haven’t tried this before but I love nuts and all things sweet. The Jane Parker Dark Fruitcake looks marvelous, and I would so like to win one. Thanks for this chance to do so. I also would LOVE to win this Jane Parker Fruitcake. I, unfortunately, have never tried it before and by looking at the picture of it, I REALLY want to try it. I will keep you in my prayers, Steve. God Bless You. I remember my parents shopping at A&P in Jacksonville, NC. Fruitcake from there every Christmas. Fond memories. Would love to try again. I would love to try this fruitcake. It looks and sounds awesome! I would very much like to WIN a 3lb Jane Parker Dark Fruitcake. I would love, love, live to win a Jane Parker fruit cake. My grandmother had one of these fruitcakes sitting on the counter by the back window of the kitchen every December! This Ann Page Fruitcake brings back so many memories of my childhood. My dad would always make sure that we had a fruitcake at the holidays (not just any fruitcake but the delicious, fruit filled, nut filled, Ann Page fruitcake). Sometimes he would have to buy another one before the holidays were over because there were 10 of us in the family and we all loved that fruitcake. Thanks for bringing back this wonderful piece of Ann Page (A&P). I would love to win this fruitcake. I miss NC food so much. Thanks! I would very much like to try the Jane Parker fruitcake. I have for decades enjoyed the Corsicana fruitcake and have even reverse engineered it from articles and videos plus some bakers’ math. The comparison would be interesting. We didn’t have an A&P where I grew up but my mother would make about 6 fruitcakes a year for friends and family. It always started months before Christmas because the cakes had to steep for awhile in liquor. I always enjoyed helping as a kid because I was drawn to the candied cherries that were used in the fruitcake. I didn’t like any of the other fruits (especially the green things) but would try to sneak as many of the cherries as I could. And, yes, I would like to try the Jane Parker fruitcake. Thanks! The Jane Parker fruitcake looks like the ones my mother always made. haven’t had one since she passed away. will try one of these, whether i win or not. The A&P fruitcake was the only one I ever liked. I did not know that It was available. I’m so glad they have brought it back. I have lots of memories of shopping at A&P. One of the cakes will be at my family Christmas dinner. So glad you are feeling better. Vertigo is terrible! Yes, I would like to win the 3lb Jane Parker Dark Fruitcake. I don’t really remember the fruitcake, maybe because it would probably have been seasonal, but I do remember the Spanish Bar Cake that mom purchased from A&P. I so glad that you are better and hope it continues. I would love to win Jane Parker’s Dark Fruitcake. I don’t personally eat raisins but my mom does and I know she would love this fruitcake. In fact, I haven’t heard of Jane Parker until I read your newsletter. I also see the fruitcakes that are in the store and those don’t look too appealing. This would make a wonderful surprise for my mom this holiday season. Plus, because of the holiday season means giving and there is only two of us in the house, minus the furbabies, we would share with our friends. Happy Holiday’s! I would love to try this fruitcake. Thanks! Growing up in Thomasville, NC in the ’50s, I remember always having delicious Jane Parker fruitcake during the holidays. I’m so glad that it is being reintroduced so that a new generation can enjoy how good a fruitcake can be. This cake sounds great. I would love to try! I have never had fruitcake–We always had fudge instead. I would love to try fruitcake–my family too! In the 1950s and early 60s I would go to the East Nashville A&P with my Mom. Around Christmas, the butcher would have pieces of the fruitcake he’d give to kids. He liked me and would wink and tell me to take two pieces. Years ago (and I DO mean years ago) (smile) 🙂 …..there was an A&P grocery store in Lumberton NC. My Grandmother ( we called her Voovie because my older brother couldn’t pronounce Luella and she didn’t want to be called Grandma 🙂 so in his attempt at pronouncing her first name (Luella) it came out sounding like “Voovie”). I am sorry, I DO digress…… Well, Voovie loved the Jane Parker dark fruitcake that came out during the holidays and she never failed to buy one when it became available. Voovie was a FANTASTIC cook, and we would drive the 20 miles on Sundays only and salivate at the thought of entering her house and the wonderful smells of delicious food it would bring. My Mother learned how to cook from Voovie and subsequently I did too. I grew up in the South so the Taste of Southern website has been a Godsend to me. I traveled as a Registered Nurse all over the country but have recently retired back to North Carolina and when I came across Steve Gordon’s website, I was elated as you can imagine as I had forgotten some of the southern and North Carolina recipes I grew up with and having the photo illustrated recipes was an awesome find. Well, I digress again (smile 🙂 ) …. I remember fondly eating the Jane Parker fruitcake and when I saw they had brought it back… I have already ordered it as I know it will sell like hotcakes and didn’t want to miss out and then have found out that a larger fruitcake in a holiday tin is now available… (WOW !!). I would SO LOVE to win and give to a special family member who also fondly remembers going to Voovie’s house with the smells of delicious food and the Jane Parker fruitcake at Christmastime especially. Steve, and the Jane Parker family …..keep up the excellent work… our prayers are with you !! God Bless you all !! This looks so delicious. I and my family love fruitcake but the only recipe I have is one that my Mom passed on to me, it has applesauce, pineapple and cherries (all canned or fresh) nothing like this. I’d love to share the recipe but would so love to win this beautiful cake. Thank you. I ordered one last year after your post. I didn’t realize they were still available. Loved the wonderful memories it brought back. My husband and I loved Jane Parker Fruitcakes. I was introduced to them by his late mother when we were first married, 49 years ago. We have really, really missed them. I was aware that you had found these cakes last year, and we did not take advantage of ordering one, wish we had. Thank you for the opportunity to win one. I would like to try the dark fruitcake, but the light would be okay, too. I’m one of those people that love fruitcake! I would love to win this 3 lb., Jane Parker dark fruitcake. It sounds really good and I haven’t eaten much fruitcake in my life. I would like to win the fruitcake for a friend’s Mom, she really likes the dish and eats it year round. I would love to try this fruitcake.